Confession: I’m one of those weird people who actually loves decluttering and organizing, especially when it comes to closets! I know most people do not share my love of closet cleaning…not by a long shot. So for all those closet organizing haters/dreaders out there, I thought I’d share my tips for making over your closet in a way that’s practical and relatively painless. I’m not here to convince you to get rid of tons of things or to wear the same outfit every day. I just want to help you make your closet into your happy place, whether it contains 20 garments or 200. Your life will be a whole lot simpler and better when you’re able to look into your closet, see clothing you love to wear, and quickly throw an outfit together! Unless you travel frequently to different climates, I strongly believe that you should only have access to one season’s clothes at a time. For this reason, twice a year (in spring and fall), I begin swapping out the clothes in my main closet based on the season. Since it’s May right now, the only clothes in my bedroom closet are ones I would potentially wear from now through August/September. Anything that I’d only wear in Fall or Winter has been moved to our guest room closet, including boots and wintery scarves or other accessories. The reasoning behind this is that there’s no point sorting through or even looking at clothes you know you won’t be wearing for months. It frees up space in your closet so that you can see everything that’s in there at a quick glance. 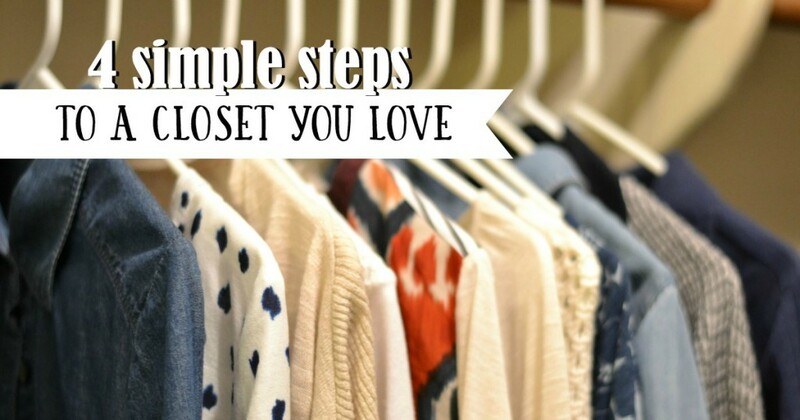 Plus, it makes the next steps much easier because you only need to deal with one season’s clothes at a time. If you don’t have a guest room or other extra closet at your disposal, put the out-of-season clothes into rubbermaid bins, underbed bins, or some other form of storage. If your main bedroom closet is large enough to store all of your clothes without crowding, then you should move the out-of-season items to the back and bring the current season’s clothes to the front. In addition to out-of-season items, I also store things I wear very rarely (like fancy dresses & shoes) in the guest room closet. On the flipside, certain items stay in my main closet year-round, like jeans, thin hoodies and light sweaters. This is the part that most people dread about closet organizing. How do you go about deciding what to get rid of? There are a lot of arbitrary rules about what to keep and what to toss, but I am throwing out those rules along with the shiny batwing top I thought was awesome in 2003. In particular, forget the “if you haven’t worn it in a year” rule. I personally lead a very casual life, which means that 95% of the time you’ll find me either in workout clothes, a casual sundress, or jeans/shorts with some sort of top. There are some dresses and shoes I only wear once a year at most, but that doesn’t mean I’m going to toss them. It just means I have no life. Try on everything in your seasonal closet and give yourself an honest assessment of how it looks. You might be surprised that some of the outfits you wear all the time aren’t nearly as flattering as some of the ones that have been lingering unworn in your closet. 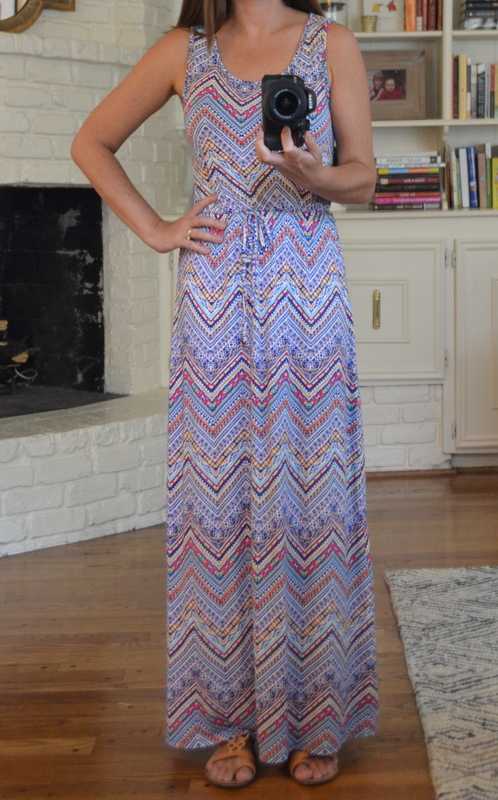 You might find a new favorite, or discover that the designer dress you’ve been dying to wear doesn’t look nearly as good on you as the Old Navy dress you’ve had for five years. Your body will change, little details like hemlines and fabrics will change, and even if styles haven’t changed much since you last wore something, your tastes might have. Also be honest with yourself about how things feel. We’ve all got a great pair of shoes that we never wear because they feel like torture devices, or a sweater that’s really cute, but terribly itchy. If you don’t like how something looks or feels on you, get rid of it. I know…this is when the litany of “what if’s?” and “but’s” comes into play. But it cost a lot and I only wore it once! What if it comes back in style? But I know I’m going to fit into that again eventually! What if I get invited to a 70’s costume party and need some plaid bellbottoms? For me, it was a pair of light pink jeans I bought last spring. When I bought them, I thought they’d look cute with a short-sleeved white or denim top, but I didn’t own either of said tops and never got around to buying one. Same goes with my white gauzy skirt, and a cute sundress I never wear because I don’t have the right bra. It stinks when you have a garment that you love, and it just sits in your closet for ages because you can’t find anything to wear with it. If you have any such items, put them in a shopping bag and take them with you the next time you go shopping. If you’re an online shopper, set them next to the computer and focus on searching for what you need to create a complete outfit. Give yourself a few weeks to find a match for your items. If you don’t, give up and get rid of the piece, or put it away until next season when you can try again. Ok, so you’re left with a closet containing items of clothing that are in season, that look and feel good on you, and that go with at least one other thing you own. Hooray! Now it’s time to get organized. It looks pretty to organize your closet by color, but it’s also highly impractical. Instead, I like to organize my closet by categories. This way, when I’m looking for something for a specific occasion, such as a moms’ night out, I can go straight to either my “casual dress” area or “nice tops to wear with jeans” area and quickly find something to wear. Everyone’s categories will be different depending on their lifestyle, work environment, etc, but I’ll show you mine to give you an idea of what I’m talking about. I’m not going to get all Mommy Dearest about the hangers being exactly the same, but you should at least try to have hangers that are similar in shape and size so that it looks uniform. I’d love to hear your simple closet organization success stories! « Grilled Potatoes in Foil with BACON! Hi, I am glad to tell you, I use some of you rules already. I moved from New York to Florida more than 2 years ago to retire and help care for my elderly parents. That said I did not need a lot of winter clothes and dark color clothes. I got rid of them . Then I needed light weight clothes and more clothes with color and sandals. I live in a condo so not a lot of room. I do what you said , and just move the out of season clothes to the back of my closet. I love to de clutter and donate, at least every 2-3 months. My continuous problem is buying clothes then not liking them soon after. That is my continuous struggle. Like you said, look in the mirror,if it does not feel or look good toss it. Thank you! Thanks for your comment, Susan! I share your issue with buying clothes and then changing my mind, but I’m getting better! The biggest lesson I’ve learned is that if it’s not comfortable I’m probably NEVER going to wear it, even if I like how it looks, so I’m trying to be more careful about what I buy. cant wait to organize and do a bit of purging!!!! I’m one of those once I get rid of something I’ll be like where is such and such piece just to remember I got rid of it. I do have mine organized by category short sleeves, long sleeves, tanks and then within each one it’s done from light to dark color. Shoes are all in plastic see through shoe boxes with a pix on front of said shoes to make things easier ? I do occasionally miss something I’ve gotten rid of, but for the most part once it’s out of my closet it’s forgotten forever! Your shoe idea sounds great! !